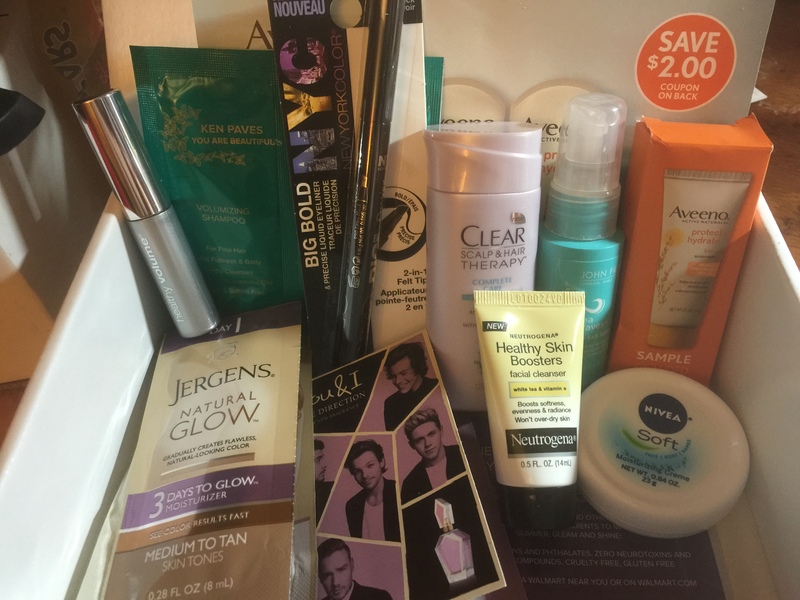 Paige- This box was a such pleasant surprise! 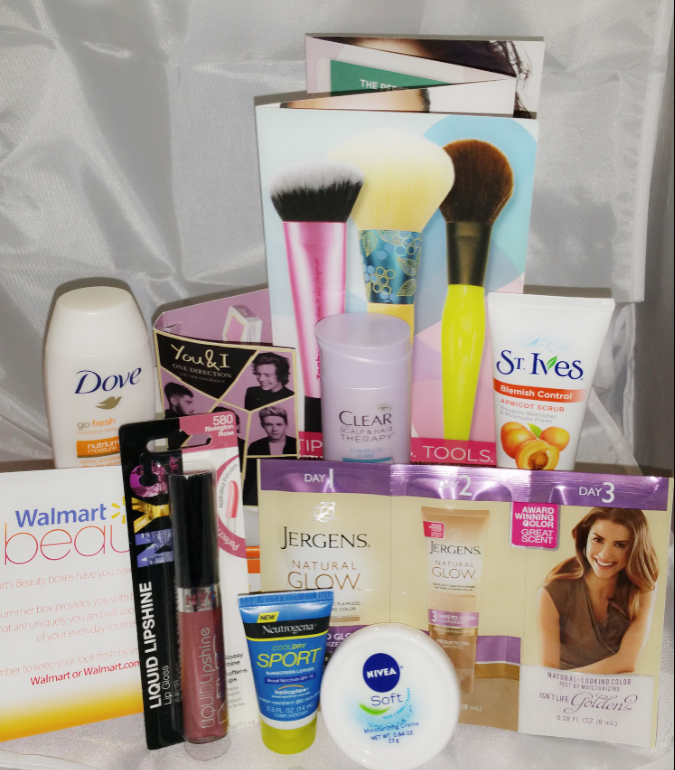 I am usually pretty happy with the Walmart beauty boxes, and end up buying a lot of the samples they send out. It also always comes with excellent coupons. There just seemed to be so MUCH in this box! I LOVE the NYC Brand So that in itself was a great deal. The color is a really pretty rose, that will go well with my complexion. I have tried the Jergens Natural Glow Before, but this seemed to be a little revamped, so I’ll definitely try it out. Nivea brand is great as well, and is perfect to stash in my purse or drop bag for traveling. I like the Neutrogena sunscreen a lot, and this sport sunscreen works really well, so this is another great find. St. Ives is ALWAYS awesome in a box, its the greatest facewash ever, and I’ve been using it since I was in my early teens. There is always that one item in any subscription box that the subscriber is just never gonna use. Its hard to make thousands of people happy with EVERYTHING, so I understand that. So, while I considered this box a pretty good one (as $5 subscription boxes go) There were a couple of things that I didn’t really need to see in there. I have received more Dove Body Washes in the last few months than I have seen in the stores in the last year. I think I got this scent alone in at least three boxes. Needless to say, I’d like to try something different. That being said, however, it will be thrown in my camp bag to be used while on trips, because the travel size is useful. The You and I one direction perfume sample was not my cup of tea. I am REALLY picky when it comes to scent, and this one was not my style at all. And lastly The Neutrogena Clear Scalp and Hair Therapy Shampoo could have been left out. I say it every time, if you send only part of a system, how am I supposed to test out how it works? I would prefer foils packets of the shampoo, conditioner, and styling aids to use at the same time and see if I like the whole system rather than just a portion of the product that doesn’t really tell me much about the whole. Neutrogena is always a good bet with my sensitive skin, and I enjoy their samples. I received the Healthy Volume mascara in travel size. Nothing earth shattering, but it’s going in my purse for those days I walk out the door forgetting to put it on. (It happens more often than I’d like to admit.) I also got the Neutrogena Healthy Skin Boosters Facial Cleanser. This came in their last box too. That’s not a bad thing as it’s the perfect travel size and is a very good cleanser. Nivea Soft Moisturizing Creme is more of a heavy cream. Definitely a night time one for me. John Frieda Sea Salt Spray – Well, I’ve never understood salt spray for hair. My hair is wild enough without putting something in it that makes it harder to work with. I keep my hair braided at the beach because If i don’t, I come out of the water with one large tangle that takes multiple washings to undo. Clear Scalp & Hair Therapy Shampoo- hmmm…I’ll need to see if I like this better than Head and Shoulders. I like finding alternatives. Also, there is actually enough in here to cover my hair. It’s a bit of a shock. NYC Big Bold 2-in-1 Felt Tip Liquid Eyeliner (full size) – honestly, I feel like someone gave me a calligraphy pen of liner and told me to go town. I can’t quite get either width to go on right. I think it’s just a practice thing for me but on the plus side, it goes on smoothly and doesn’t smear. Ken Paves Volumizing Shampoo and Conditioner – whelp, these are going into the guest bathroom sample bucket because there isn’t enough of either sample in here to anything but make my hair laugh. It’s an awesome teal color package though. Aveeno Lotion Sunscreen SPF 30- This so got used on the 4th. I love Aveeno lotion, it’s my nightly go-to so I have high hopes for this. AND the little card attachment (which also has a $2.00 off coupon on it) says they make it in SPF 50. Here’s to the white girls who burn! Jergens Natural Glow (sample size for 3 days) – I actually already use this product. it’s one of the only tanners I’ve found that doesn’t turn me carroty. I can’t use this Medium to Tan shade they sent because, well, see above about being white, but, it’s a great product for most people who received this box. You and I One Direction Eau de Parfum (travel size) – It’s not horrible. It’s a little sweet for my taste, too much floral, but better than I expected it to be when I saw 5 guys on the front of the card. I think I’ll still stick with my Burberry but perfume samples are one of my favorites and I hope they keep sending them. I hope mine comes soon! For $5 its worth it for me.